I have to say, every night I when I pray, I thank the good Lord for granting me with such an unique, fun family who unknowingly gives me more potential blogging material then I could ever use. 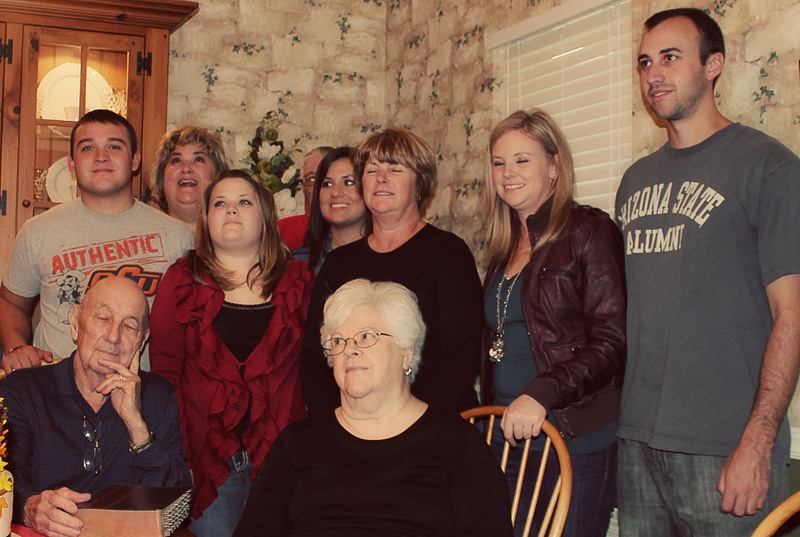 …And it’s no wonder we have VERY few family pictures, this isn’t even close to all of us and we still couldn’t seem to get it right. 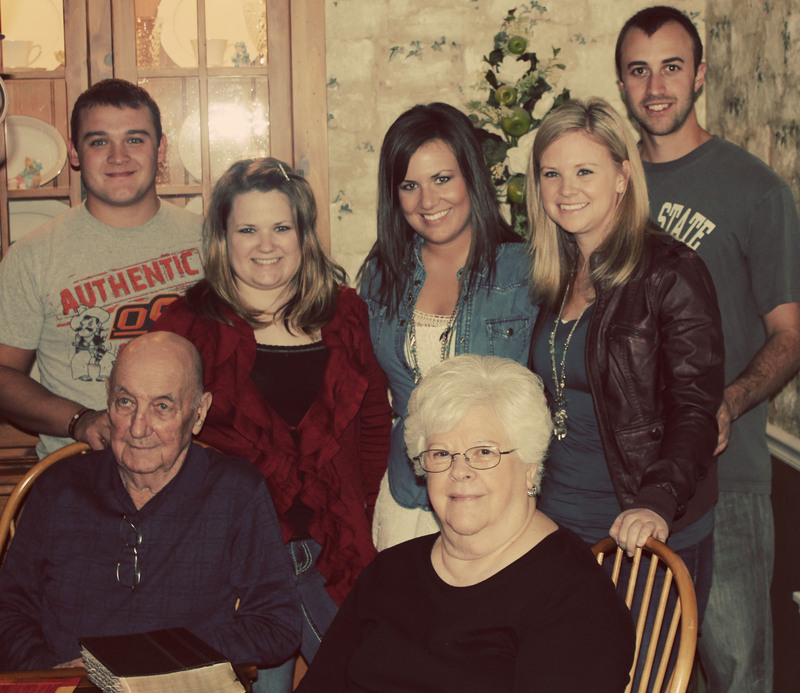 Recently, we celebrated my Grand-Dad’s 80th birthday at my parents house. 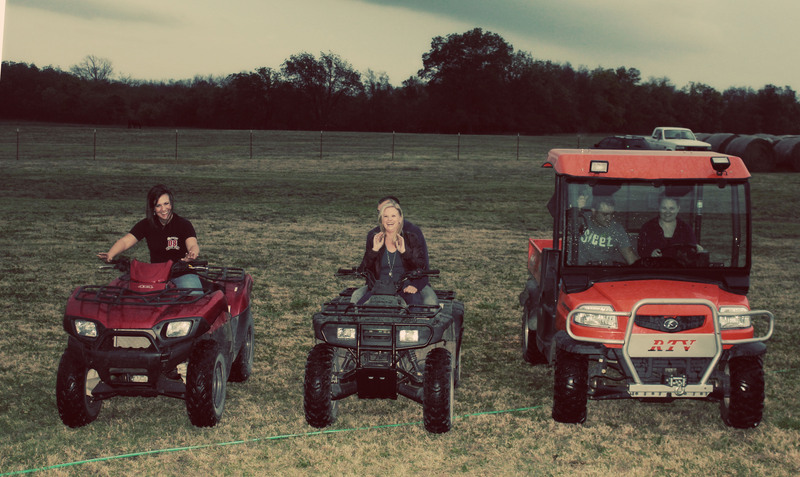 The smokers were fired up with ribs, the house was abuzz with laughter, the horses were saddled for riding and college football blared from the living room TV… It was a perfect day. Towards the evening, as I passed through the breakfast room, I heard my Aunt Charissa exclaim, “Do you know what we should do?! 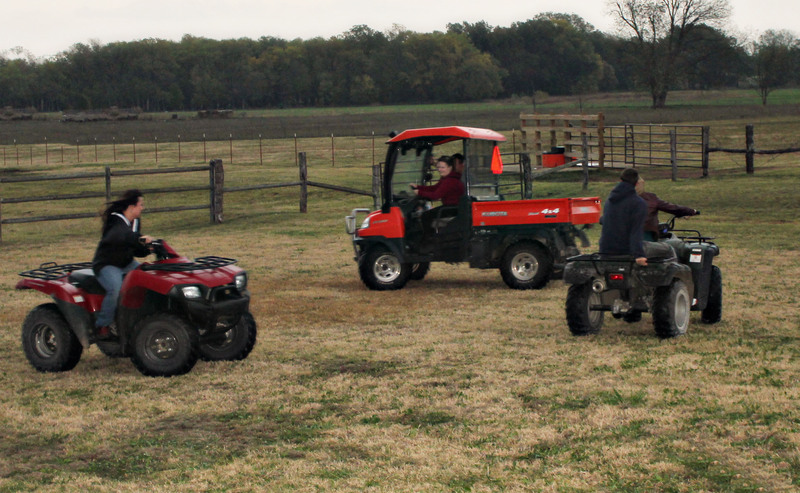 Synchronized ATV’s! I’ll direct this.” As most of the room looked at her to see if she was being serious, it was at the time, my cousin, Kristin and I proclaimed, “We ride at dawn,” fists raised in the air, with true nerdy enthusiasm. 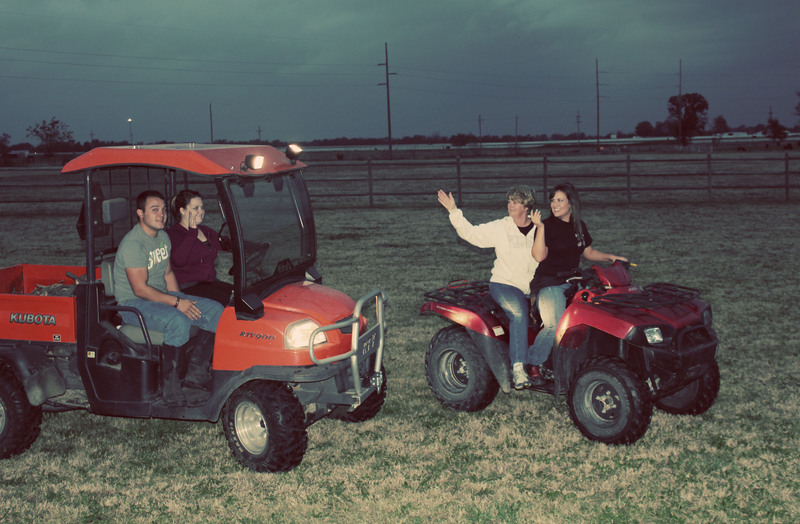 The next thing I knew, I was sitting on a 4-wheeler waiting for the festivities to commence. Kristin had issues with “reverse.” This did not please our Conductor. This move became known as “Circle the Wagons” and the only move we had down pat. Yes… I have my pants tucked into my boots, don’t judge. 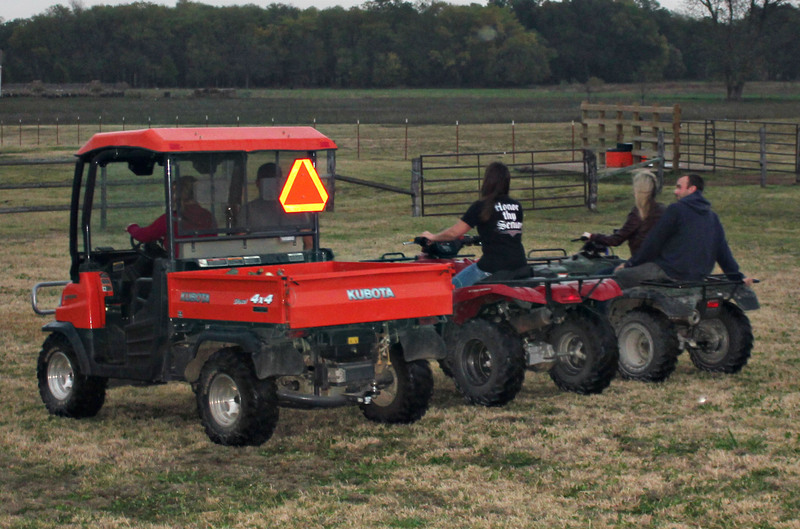 For the finale, “Master of Ceremonies,” “The Conductor,” “Our Fearless Director,” and whatever other name she earned, hopped on the back of my 4-wheeler to be paraded for a victory lap. The looks on my sister and brother-in-law’s faces say it all. Yup, this happened, in the backyard, in the rain, with my mother trying to figure out how to use my camera, my aunt yelling “figure eights people! !” and an abundance of giggling. It may seem silly, and it may not have gone down exactly how my aunt planned, but when it’s all said and done these are the moments that build a family, and the memories that last a lifetime. My point, don’t be afraid to be a little corny, oh and make sure and have a camera nearby. Loved this post! So funny and sounds like something my family would do!